The boiler house will be part of the factory/mill complex. Most mills and factorys had their own steam engines to power the machinery, so a boiler house wouldn’t go a miss on any old industrial complex. the boiler house will eventually be sited near to the chimney for obvious reasons. 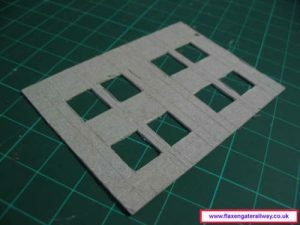 The building is made primerily of cereal box card, brick paper and PVA glue. The card was carefully measured and cut out to shape using a sharp knife and a cutting board. The front wall was covered in brick paper and other lenghts of card with brick paper were added to make th biulding more 3D. Dirty paper off an old model railway magazine was used for the Lintels above the windows. 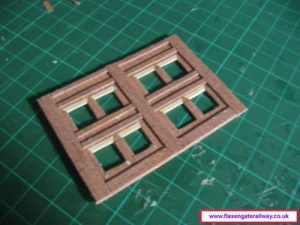 The four sides complete like the front were glued together with a rectangular piece of card in the middle to keep the shape. The windows were added in these were pieces of acetate with squares on them normally used for cross stitch planning. 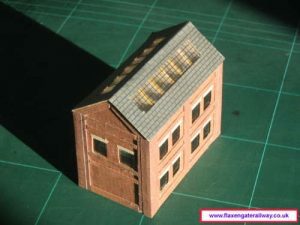 A roof was made, this can be removed to get inside the building for adding lights and interior detail.